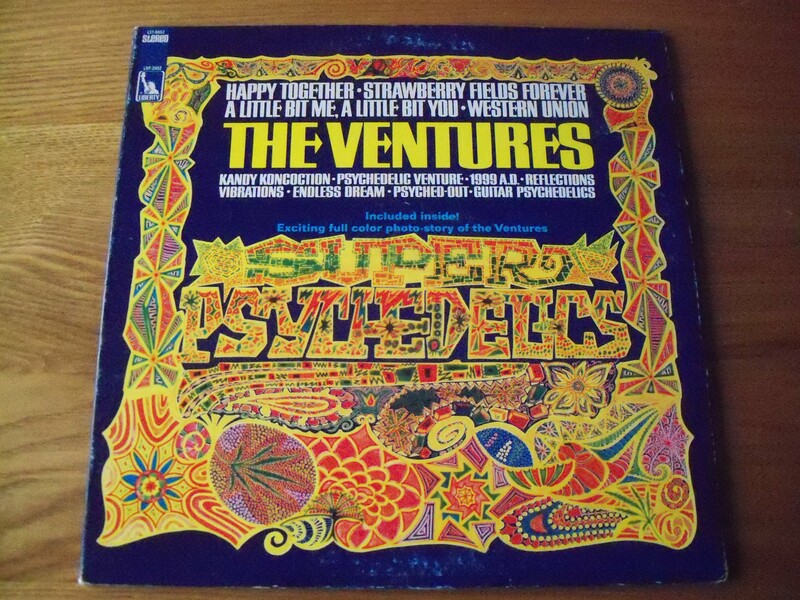 Super Psychedelics was The Ventures 25th LP. Not bad for a band who released their debut album in 1960. The record you are about to hear features “twelve tunes of excitement” nicely split 7:5 between originals and cover versions. Side 1 starts with a spaced-out take on Strawberry Fields Forever. Marvellous chimes and some ethereal guitars make for an explosive beginning. A storming Kandy Koncoction moves like a lightning train while Western Union unfolds at a more leisurely pace. Mutant flower-power versions of Happy Together and A Little Bit Me, A Little Bit You complete the quintet of other people’s tunes. The seven original tracks are a cracking mixture of exploito genius and groovy instros for hipsters. Psychedelic Venture sounds like ‘shudder surf’ while the spooky Reflections is perfect for moonlight beach action. Endless Dream shimmers with molten riffage and twisted 20-years-before-the-Pixies harmonies while Psyched-Out explodes in a percussive frenzy.